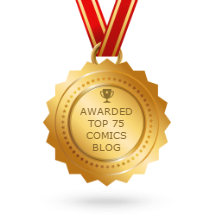 Today's reviews feature comics drawn, but not (solely) written by, CCS cartoonists. 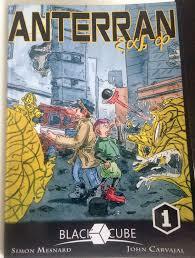 Anterran Day 0: 1-3, by John Carvajal and Simon Mesnard. Carvajal drew this post-apocalyptic fantasy set on an alien world where smart phone-like objects wound up causing the end of the world. With only a few survivors left on earth, there was a war between the President and his soldiers and the mutants whose addiction to the devices known as Sok'as caused them to turn. The story follows a scientist, a teen that he rescued and a mysterious woman that they save from mutants. It's a solid story with some good twists and turns, but Carjaval's grotesque, funny art is what really sells it. Big bulbous noses, beady eyes, sharp teeth and backgrounds that vary from ramshackle to high tech make this series fun to look at on every page. What really sells it are the watercolors (or watercolor effects) that Carvajal uses, especially the way he uses them to create a particular facial design for each character. The red noses and flushed cheeks stand out, making the whole project look like something that resembles E.C. Segar's Popeye more than Mad Max. 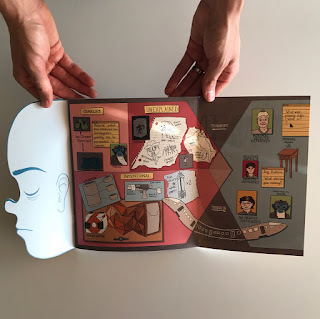 Half Asleep Volume 8, by Beth Hetland and Kyle O'Connell. This is the final chapter of this epic story about a scientist and her daughter Ivy at odds over their exploration of dream space. The cover flap is a marvel of design, neatly summarizing and explaining a few of the comic's central ideas in a spectacular manner. In terms of the story (which is way too convoluted to go into at this point with regard to the last chapter), one of the things I liked best about it was the central ambiguity of its characters, especially Dr. Lassette, Ivy's mother. She lied and kept secrets from her daughter for years and treated her like a research subject. However, she also clearly loved her daughter and saw her potential as a dream explorer who could make a better life for everyone with her discoveries. As previous issues revealed, something went horribly wrong when Ivy was off in the dream world, and this issue revealed the reason why: the scientists found it easier to enter through nightmares than dreams. Hetland went all-out in this issue, using several different line weights and drawing styles to get across the way in which Ivy was starting to find herself seeing things from the dream world in the real world, and how objects were disappearing around her. The climactic battle with a horrifying nightmare creature sees Hetland's art at its sharpest, as the inky jet black creature really fills up every panel. This is going to be a story well worth revisiting and chewing over. 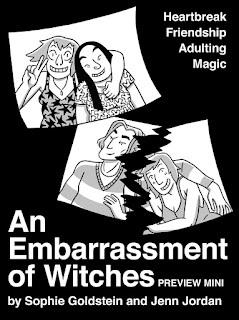 An Embarrassment of Witches, by Sophie Goldstein and Jenn Jordan. This was the team responsible for the sometimes rambling, frequently entertaining webseries Darwin Carmichael Is Going To Hell. That series saw both writer and artist trying to figure things out on the page, and it's obvious that their second project together is going to be much more self-assured. For one thing, Goldstein has become one of the best artists in comics. Her science-fiction work is brilliantly pointed and challenging, if downbeat. Jordan's tone is much more lighthearted, allowing Goldstein to stretch a different set of creative muscles. This mini is an ashcan featuring some of their work to date, with the final results set to be published by Top Shelf. Whereas Darwin Carmichael was a slice-of-life comic revolving around a set of apartment-mates and their friends, Witches has a tighter focus. It's a post-breakup comic about a recent college grad named Rory whose boyfriend tells her that he wanted to see other people right before they were going to get on an airplane together and head to Australia for several months. All of this is the foreground information. The background is that this is a world where magic is real and part of everyday life, much like the background of Darwin Carmichael is that every religion and mythology was real and its gods and creatures lived on earth. Magic here is used in storytelling terms as a way of bringing metaphors to life in extreme ways or expressing strong emotions. It's also very much cringe comedy, as we follow Rory make a series of bad decisions, starting with lying to her controlling Mother about not going to Australia. The mini sets up that like and her decision to live in a closet in her sister's place. Goldstein has a talent for instantly communicating a character's qualities through her design. The boyfriend, Holden, has permanently arched eyebrows that are a tell of his know-it-all tendencies. Her wiry mother has a taut quality that reveals her tendency to crowd her daughter. Rory herself has somewhat blank eyes (indicating her journey ahead) but also an edgy quality that displays her thorniness. Her sister Angela is all gentle curves and straight black hair, but even that mild-mannered quality has some darkness to it. This has the potential to be a big hit, if Top Shelf markets it right.